Convection models of the sun, with increasing amounts of rotation from left to right. Warm flows (red) rise to the surface while others cool (blue). These simulations are the most comprehensive high-resolution models of solar convection so far. See video here. Image courtesy of Nick Featherstone, University of Colorado Boulder. It’s easy to take the Earth’s magnetic field for granted. It’s always on the job, shielding our life-giving atmosphere from the corrosive effects of unending solar radiation. Its constant presence also gives animals – and us — clues to find our way around. This vital force has protected the planet since long before humans evolved, yet its source – the giant generator of a heat-radiating, electricity-conducting liquid iron core swirling as the planet rotates – still holds mysteries. Understanding the vast and complex turbulent features of Earth’s dynamo – and that of other planets and celestial bodies – has challenged physicists for decades. “You can always do the problem you want to, but just a little bit,” says Nick Featherstone, research associate at the University of Colorado Boulder. Thanks to his efforts, however, researchers now have a computer code that lets them come closer than ever to simulating these features in detail across a whole planet or star. The program, known as Rayleigh, is open-source and available to anyone. To demonstrate the power of Rayleigh’s algorithms, a research team has simulated the dynamics of the sun, Jupiter and Earth in unprecedented detail. The project has been supported with a Department of Energy Innovative and Novel Computational Impact on Theory and Experiment (INCITE) program allocation of 260 million processor hours on Mira, an IBM Blue Gene Q supercomputer at the Argonne Leadership Computing Facility, a Department of Energy user facility. Earth’s liquid metal core produces a complex combination of outward (red) and inward (blue) flows in this dynamo simulation. Image courtesy of Rakesh Yadav, Harvard University. This big code stemmed from Featherstone’s research in solar physics. Previously scientists had used computation to model solar features on as many as a few hundred processor cores simultaneously, or in parallel. But Featherstone wanted to tackle larger problems that were intractable using available technology. “I spent a lot of time actually looking at the parallel algorithms that were used in that code and seeing where I could change things,” he says. When University of California, Los Angeles geophysicist Jonathan Aurnou saw Featherstone present his work at a conference in 2012, he was immediately impressed. “Nick has built this huge, huge capability,” says Aurnou, who leads the Geodynamo Working Group in the Computational Infrastructure for Geodynamics (CIG) based at the University of California, Davis. 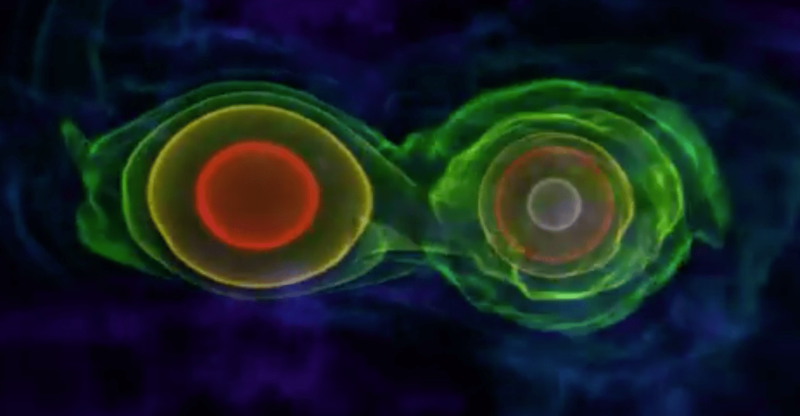 Though stars and planets can behave very differently, the dynamo in these bodies can be modeled with adjustments to the same fundamental algorithms. Aurnou soon recruited Featherstone to develop a community code – one researchers could share and improve – based on his earlier algorithms. The team initially performed simulations on up to 10,000 cores of NASA’s Pleiades supercomputer. The group focused on one problem each year, starting with Featherstone’s specialty: the sun. In its core, hydrogen atoms fuse to form helium, releasing high-energy photons that bounce around a dense core for thousands of years. They eventually diffuse to an outer convecting layer, where they warm plasma pockets, causing them to rise to the surface. Finally, the energy reaches the surface, the photosphere, where it can escape, reaching Earth as light within minutes. Like planets, the sun rotates, producing chaotic forces and its own magnetic poles that reverse every 11 years. The processes that cause this magnetic reversal remain largely unknown. Featherstone broke down this complex mixture of activity into components across the whole star. “What I’ve been able to do with the INCITE program is to start modeling convection in the sun both with and without rotation turned on and at very, very high resolution,” Featherstone says. 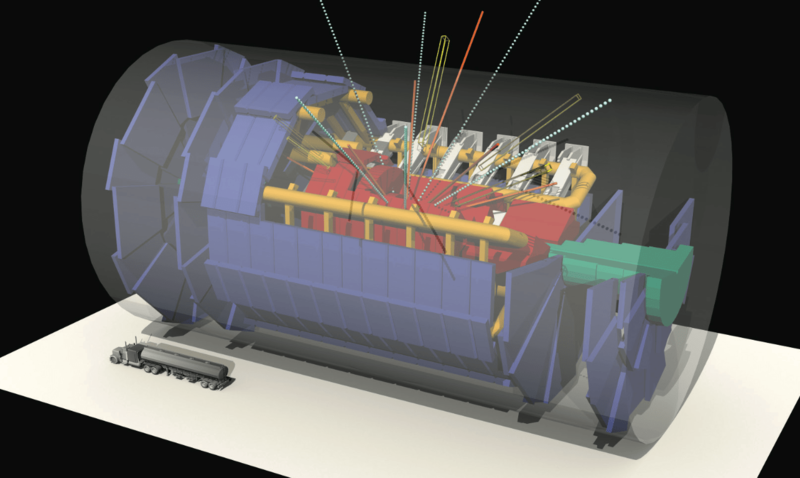 The researchers plan to incorporate magnetism into the models next. The team then moved on to Jupiter, aiming to predict and model the results of NASA’s Juno probe, which orbits that planet. In Jupiter’s core – the innermost 95 percent – hydrogen is compressed so tightly that the electrons pop off. The mass behaves like a metal ball, Aurnou says. Its core also releases heat in an amount equal to what the planet receives from the sun. All that convective turbulence also rotates, creating a potent planetary magnetic field, he says. Until recent results from Juno, scientists didn’t know that surface jets on Jupiter extend deep – thousands of kilometers – into the planet. Juno’s images reveal clusters of geometric turbulence – pentagons, octagons and more – grouped around the Jovian poles. A model of interacting vortices simulating turbulent jets that resemble those observed on Jupiter. Yellow features are rotating counterclockwise, while blue features rotate clockwise. Image courtesy of Moritz Heimpel, University of Alberta. Turbulence is difficult to simulate because it includes the cumulative effects of minuscule changes coupled with processes that are occurring over large parts of a planet. With these results, the team hopes to pare down simulations to incorporate the simplest set of inputs needed to understand our complex terrestrial system. The INCITE project results are fueling new research opportunities already. Based on the team’s solar findings, in 2017 Featherstone received a $1 million grant from NASA’s Heliophysics Grand Challenge program, which supports research into solar physics problems that require both theory and observation. The project shows how federal funding can dovetail to help important science reach its potential, Aurnou says. CIG originally hired Featherstone using National Science Foundation funds, which led to the INCITE grant, followed by this NASA project, which will model even more of the sun’s fundamental physics. That information could help protect astronauts from solar radiation and shield our electrical grids from damage and outages during periods of high solar activity. The CPSFM team continues to optimize QMCPACK for ever-faster supercomputers, including OLCF’s Summit, which will be fully operational in January 2019. The higher memory capacity on that machine’s Nvidia Volta GPUs – 16 gigabytes per graphics processing unit compared with 6 gigabytes on Titan – already boosts computation speed. With the help of OLCF’s Ed D’Azevedo and Andreas Tillack, the researchers have implemented improved algorithms that can double the speed of their larger calculations. The Titan supercomputer and a tool called Starkiller help Stony Brook University-led team simulate key moments in exploding stars. A volume rendering of the density after 0.6 and 0.9 solar mass white dwarfs merge. The image is derived from a calculation performed on the Oak Ridge Leadership Computing facility’s Titan supercomputer. The model used Castro, an adaptive mesh astrophysical radiation hydrodynamics simulation code. Image courtesy of Stony Brook University / Max Katz et al. The spectacular Supernova 1987A, whose light reached Earth on Feb. 23 of the year it’s named for, captured the public’s fancy. It’s located at the edge of the Milky Way, in a dwarf galaxy called the Large Magellanic Cloud. It had been four centuries since earthlings had witnessed light from a star exploding in our galaxy. A supernova’s awesome light show heralds a giant star’s death, and the next supernova’s post-mortem will generate reams of data, compared to the paltry dozen or so neutrinos and X-rays harvested from the 1987 event. Astrophysicists Michael Zingale and Bronson Messer aren’t waiting. They’re aggressively anticipating the next supernova by leading teams in high-performance computer simulations of explosive stellar events, including different supernova types and their accompanying X-ray bursts. Zingale, of Stony Brook University, and Messer, of the Department of Energy’s Oak Ridge National Laboratory (ORNL), are in the midst of an award from the DOE Office of Science’s Innovative and Novel Computational Impact on Theory and Experiment (INCITE) program. It provides an allocation of 45 million processor hours of computer time on Titan, a Cray XK7 that’s one of the world’s most powerful supercomputers, at the Oak Ridge Leadership Computing Facility, or OLCF – a DOE Office of Science user facility. The simulations run on workhorse codes developed by the INCITE collaborators and at the DOE’s Lawrence Berkeley National Laboratory – codes that “are often modified toward specific problems,” Zingale says. “And the common problem we share with ORNL is that we have to put more and more of our algorithms on the Titan graphics processor units (GPUs),” specialized computer chips that accelerate calculations. While the phenomena they’re modeling “are really far away and on scales that are hard to imagine,” the codes have other applications closer to home: “terrestrial phenomena, like terrestrial combustion.” The team’s codes – Maestro, Castro, Chimera and FLASH – are available to other modelers free through online code repository Github. With a previous INCITE award, the researchers realized the possibility of attacking the GPU problem together. They envisioned codes comprised of multiphysics modules that compute common pieces of most kinds of explosive activities, Messer says. They dubbed the growing collection of GPU-enabled modules Starkiller. “Starkiller ties this INCITE project together,” he says. “We realized we didn’t want to reinvent the wheel with each new simulation.” For example, a module that tracks nuclear burning helps the researchers create larger networks for nucleosynthesis, a supernova process in which elements form in the turbulent flow on the stellar surface. 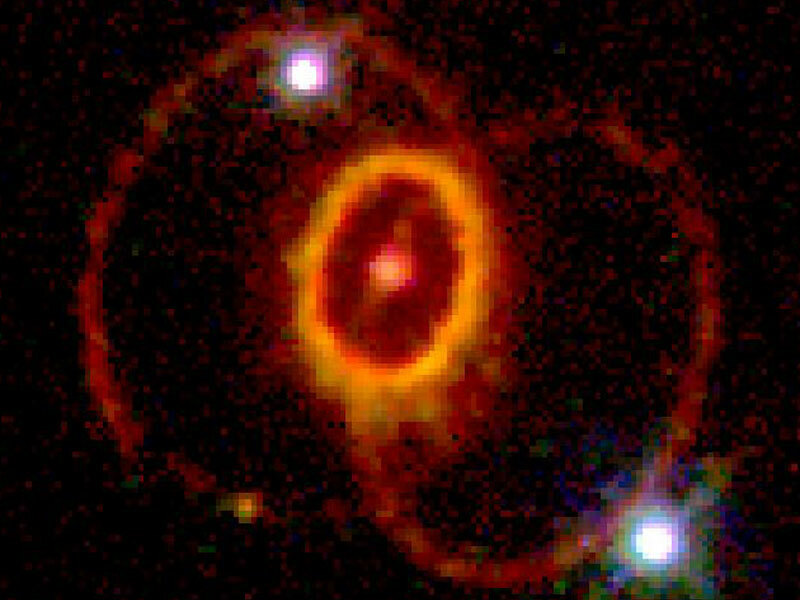 Supernova 1987A, a type II supernova, arose from the gravitational collapse of a stellar core, the consistent fate of massive stars. Type Ia supernovae follow from intense thermonuclear activities that eventually drive the explosion of a white dwarf – a star that has used up all its hydrogen. Zingale’s group is focused on type Ia, Messer’s on type II. A type II leaves a remnant star; a type Ia does not. Stars like the sun burn hydrogen into helium and, over enormous stretches of time, burn the helium into carbon. Once our sun starts burning carbon, it will gradually peter out, Messer says, because it’s not massive enough to turn the carbon into something heavier. Zingale is modeling two distinct thermonuclear modes. One is for a white dwarf in a binary system – two stars orbiting one another – that consumes additional material from its partner. As the white dwarf grows in mass, it gets hotter and denser in the center, creating conditions that drive thermonuclear reactions. The other mode is being modeled with former Stony Brook graduate student and INCITE co-principal investigator Max Katz, who want to understand whether merging stars can create a burning point that leads to a supernova, as some observations suggest. His simulations feature two white dwarfs so close that they emit gravitational radiation, robbing energy from the system and causing the stars to spiral inward. Eventually, they get so close that the more massive one rips the lesser apart via tidal energy. Zingale’s group also continues to model the convective burning on stars, known as X-ray bursts, providing a springboard to more in-depth studies. He says they’re the first to simulate them in three dimensions. That work and additional supernova studies were supported by the DOE Office of Science and performed at OLCF and the National Energy Research Scientific Computing Center, a DOE Office of Science user facility at Lawrence Berkeley National Laboratory.